With the rise of digital information, digital communication, our way of reading, our way of consuming information has changed. And screens are not a 100% exact substitute for paper: our brain sees them differently. Let’s take a look at some scientific, neurological studies from the past few years on both the effect of digital versus print ads and reading texts on a screen or paper. This study used electroencephalography (EEG) and eye tracking to check the response of 270 participants. The study focused on ease of understanding and persuasiveness, plus the time needed to absorb the message. 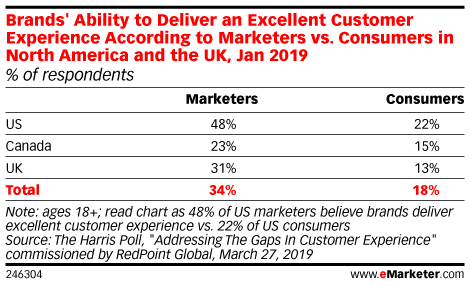 Direct mail is easier to understand and more memorable than digital media: it requires 21% less cognitive effort to process and elicits a much higher brand recall. Direct mail is far more persuasive than digital media: its motivation response is 20% higher – even more so if it appeals to more senses beyond touch. Direct mail is visually processed quicker than digital media: when considered in concert with its higher motivation and lower cognitive load, this suggests it gets the message across faster. Direct mail is more likely to drive behavior than digital media: surpassing the important motivation-to-cognitive load ratio threshold of 1. Also from 2015 is research by the US Postal Services (USPS), in collaboration with Temple University’s Center for Neural Decision Making. They used eye tracking, core biometrics (heart rate, sweat, motion, respiration) and fMRI (functional magnetic resonance imaging for brain activity) to check the response to both digital and physical ads. In total 64 persons participated in the first phase, is the exposure to ads and the physical response (eye tracking, core biometrics). From that pool 48 people eventually participated in phase 2, is the fMRI, where the recall of ads and willingness to pay was checked. A bit older is the research performed by Millward Brown and Bangor University and commissioned by UK’s Royal Mail. They also used fMRI and tested 20 participants. The conclusion was that physical materials lead to a greater emotional processing, physical media is better at becoming part of the memory. The real experience is also internalized, which means the materials have a more personal effect, and therefore should aid motivation. The University of Stavanger in Norway performed a reading and comprehension test with 72 children, aged 15 to 16 year. Their conclusion is that reading narrative and expository texts on a computer screen lead to poorer reading comprehension than reading the same texts on paper. Which of course has a serious implication in education. If you want to know more, I can recommend an article from Scientific American and a White Paper from MPA – The Association of Magazine Media (full report, 1-page summary). Both contain lots of references to studies that are relevant to this topic. And one important conclusion is the fact that we tend to scan digital information, while paper facilitates deep reading. Yes, some reports have different findings, e.g. a 2016 master’s thesis “eBooks and Print Books Can Have Different Affects on Literacy Comprehension”. The study was limited to six kids (7 to 8 years old) and specifically used the enhanced e-book features, e.g. the included dictionary. The conclusion is that ebooks contain engaging reading features that help students improve reading comprehension. Since these kids were rather young and still learning how to read, could that be the reason why ebooks – and more specifically the enhanced features – showed better results? Another study comparing the use of paper vs. tablets in education is from Coast Guard Leadership Development Center (2015). The number of participants in this reading comprehension test was 231, 119 of them read an 800-word article on a screen, 112 read the article on paper. A multiple choice test and a short-answer test afterward did not show a statistically significant difference in group means between paper and tablet readers. But: when looking into more detail paper readers had greater frequencies of higher scores for both multiple-choice recall and short answers that measured comprehension. 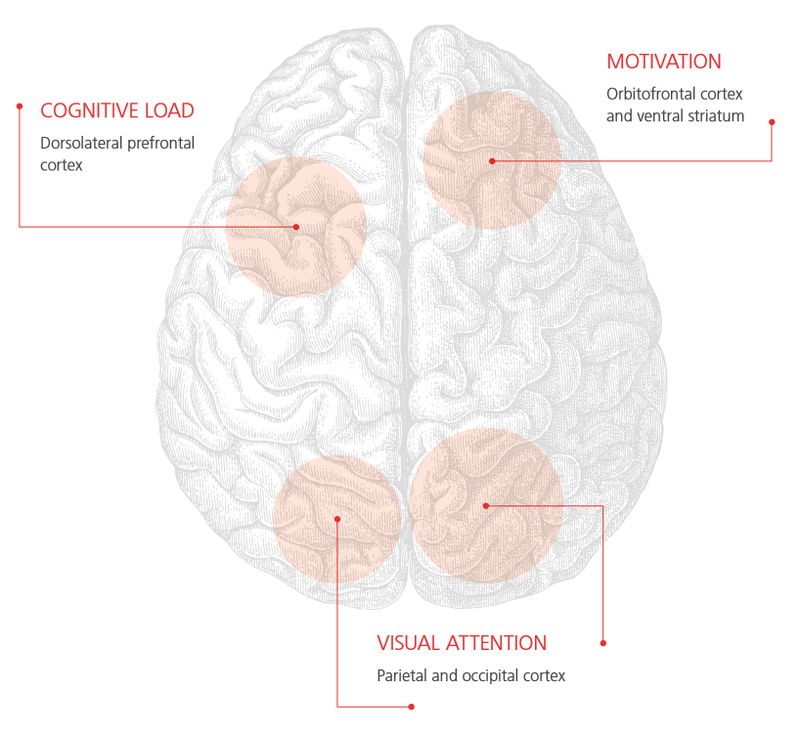 The way our brain responds to information on paper or digital is different. Especially with advertising, this is different: we spend more time with paper, we recall paper ads better than digital ads. But also when reading texts, there is a difference. When using digital information, we tend to scan it more, while paper facilitates deep reading. 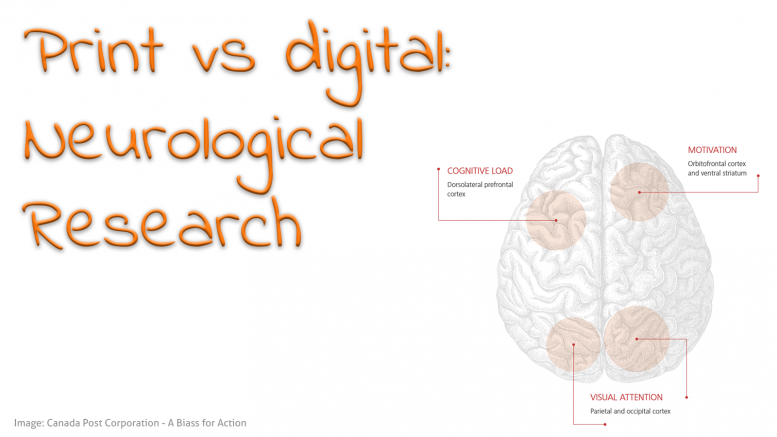 2 Comments on "Neurological research: print vs. digital"
Great post. The question is: How do we transfer the conclusions of these results to the customers or potential customers of printing companies?